Far-right groups are being investigated for potentially breaching Charity Commission rules after the Guardian found they were distributing food and clothes to homeless people. The fascist party the National Revival of Poland – known as Narodowe Odrodzenie Polski (NOP) – is one of several far-right groups across Britain that have launched charity campaigns. The NOP’s “White Rescue: Charity campaign for Europeans”, is billed as a whites-only outreach scheme, has involved working with the far-right British group National Front to hand out food to homeless people in Glasgow, Exeter and London. Idź Pod Prąd, a far-right media organisation that runs local community groups, also claims it is running a club helping Polish veterans in Stoke-on-Trent. In Newcastle, the English Defence League has been posting on its Facebook page to say it is gathering donations for “homeless outreach” work, which is run by the EDL Angels, the women’s faction of the group. When approached by the Guardian, a spokesperson said that they did not discriminate and worked with people from a variety of ethnic backgrounds. 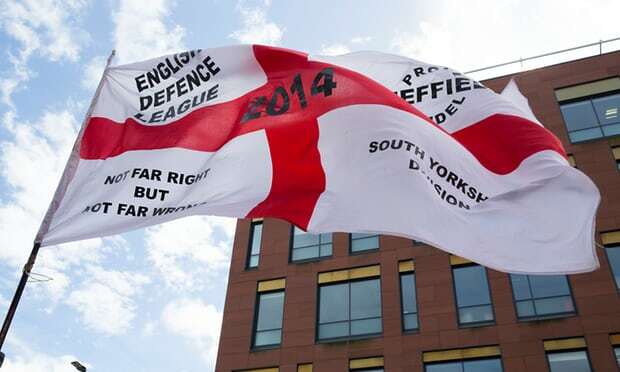 They claimed the women’s outreach work had been wrongly advertised as being linked with the EDL and as a result, the local chairman resigned on Saturday. These groups are not authorised charities and in some instances are openly soliciting for donations. Charity Commission rules state that a charity cannot be used as a vehicle for the expression of political or extremist views. “We will further assess the material … on these organisations’ activities regarding outreach work with the homeless in order to determine whether this presents regulatory concerns and, if so, what regulatory action, if any, may need to be taken,” a spokesperson for the Charity Commission said. Anti-far right groups described the findings as “very worrying” and said far-right groups were “preying on the vulnerable”. The NOP and Idź Pod Prąd have networks and groups operating in the UK. Idź Pod Prąd said their club in Stoke-on-Trent organised help for Polish veterans in the UK. It did not respond to a request for comment.